Welcome to the farm, where the primary crop is big towers and antennas! "The Farm" as it is referred to by WØAIH regulars is located on 120 acres of rolling farmland in West Central Wisconsin, just southeast of Eau Claire. Most hams who have driven on I-94 between Chicago and Minneapolis have seen the endless array of towers that can be seen on the hills overlooking the interstate at mile marker 76. Located on the site are more than 50 towers. About 25 towers or poles are used as vertical radiators plus numerous telephone poles and other towers that are used to support feed line, ends of wire antennas and what ever else needs to be held in the air. The main building, commonly referred to as the Chalet, is a building originally used to house a broadcast station transmitter at a different antenna site. Currently it houses five of the six HF operating positions along with 2 spotting positions. The 20 meter position is located about 300 feet away in a small 6 by 8 building known as the "Air Force Shack", because in a previous life it was a portable Air Force communications shelter. Here you will find both the 20 meter position and the 20 meter spotter. In the case of a single-op or multi-single contest, most of the 20 meter antennas can be rerouted to the main building. As you can see in the pictures there is enough feed line running between the two building to reroute almost anything, and this is also true of the rotor controls. Also the main building can be rearranged so that all the operating controls are located on one side. Mostly the 15 meter and 40 meter positions are used for this. The rest of the out buildings are used for storage of cable, antennas and parts use to fabricate any of the special items uses in the construction of the site. The 160M station runs an FT-1000D to a homebrew 4-1000A. The 80M station usually runs an FT-1000D driving a homebrew 4-1000A. The 40M station uses a Icom IC-775 driving a homebrew 4-1000A. In DX contests, the 3el @ 70' is typically used toward South America, while the stacked pair is used toward Europe or Japan. 15 Meters has a wide variety of antennas available, allowing most directions and propagation modes to be covered without waiting for antennas to rotate. Two towers are dedicated to 15M, a 190 x 18" Wind Charger holding the 4/4/4/4 stack, and a 183' Rohn 45 with the side mounted 5/5 and the high 5ele Telrex. The side mounts are all homebrew and powered by Ham-type rotors. The station usually runs an IC-765 to an Alpha 87A. The 15M operating position can be configured as a single-operator position for running all bands. The transition to single-op is difficult and is done only occasionally. 10 Meters is one of the strongest bands at the Farm. 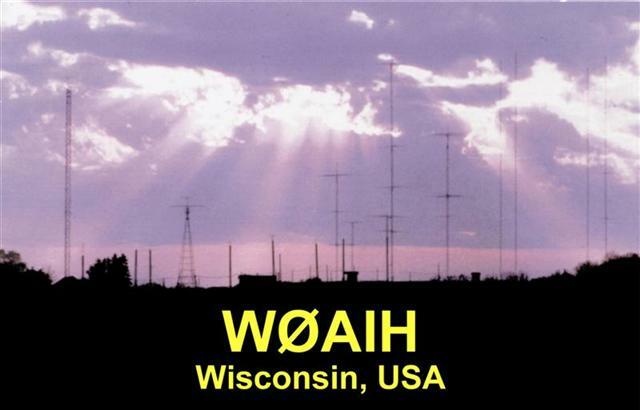 Our location in the Upper Midwest provides and excellent scatter and Sporadic-E distance to the East Coast and the Gulf Coast on both 10M and 6M. During the low sunspot years and other "dead band" conditions, the Farm has often produced one of the top scores in the 10 Meter Contest. The 10M station usually runs an IC-775 or IC-765 to an Alpha 86 or a homebrew 4-1000A. 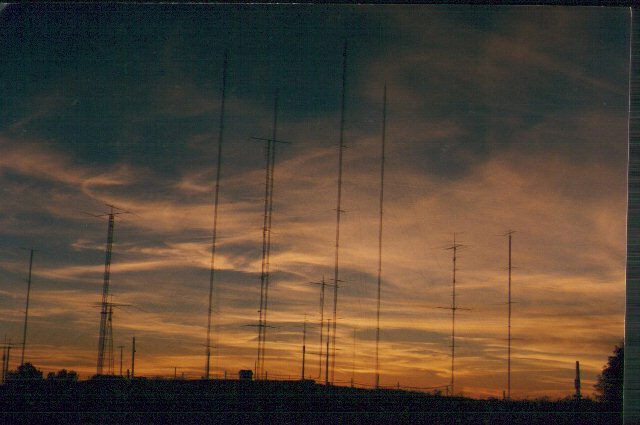 The large number of antennas available allows complete separate SSB and CW stations to be configured for the 10M Contest. 1 Strum 40 m 3/3 ele Hygain 40m 180/90 200 Guyed 54 ? 3 FVF Mem TH5 60 ft 60 SS?? 15 First Tower West of Strum ??? Guyed I see something in my pix. I don’t know what it is. 3 ele wire beam ?? to SE, in valley ?? 11 ?? 1040 foot beverages. 3 element @ 80 feet (twr 12) this is on the 10m rot tower ? ?